Create a casual contemporary feel in your home with the Brambil Leather Sofa from the Brambil Top Grain Leather Collection by Simon Li. The rich chestnut brown of the top-grain leather and leather match application works with the contrasting black welt and the sleek and simple styling to create a relaxed, yet polished, look that is sure to work with a variety of decor styles. Create a casual contemporary feel in your home with the Brambil Leather Sofa from the Brambil Top Grain Leather Collection by Simon Li. Brambil Top Grain Leather Sofa from Simon Li. 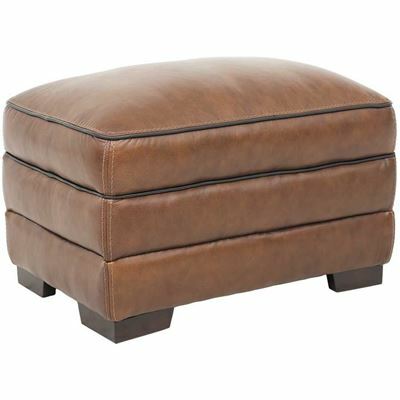 Couch covered in a top grain leather and leather match application in a chestnut brown color. Create a casual contemporary look in your room with the Brambil Top Grain Leather Collection from Simon Li. The frames are constructed of laminate and wood composites with quality foam cushion core construction for seating comfort. 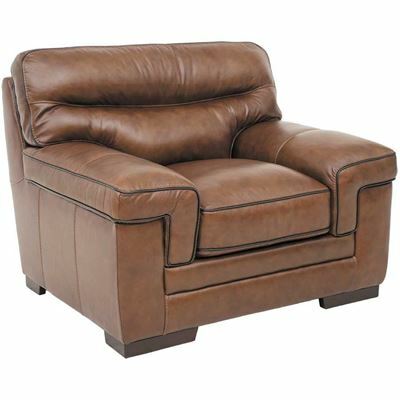 This couch is covered with a soft, top grain leather and bonded leather match application. The leather has a rich brown color contrasted with a black welt following the contours of the silhouette. The look of your room will never go out of style if you add the Brambil Top Grain Leather Collection to your home.